How Much Does Hardwood Floor Refinishing Cost in Kansas City? 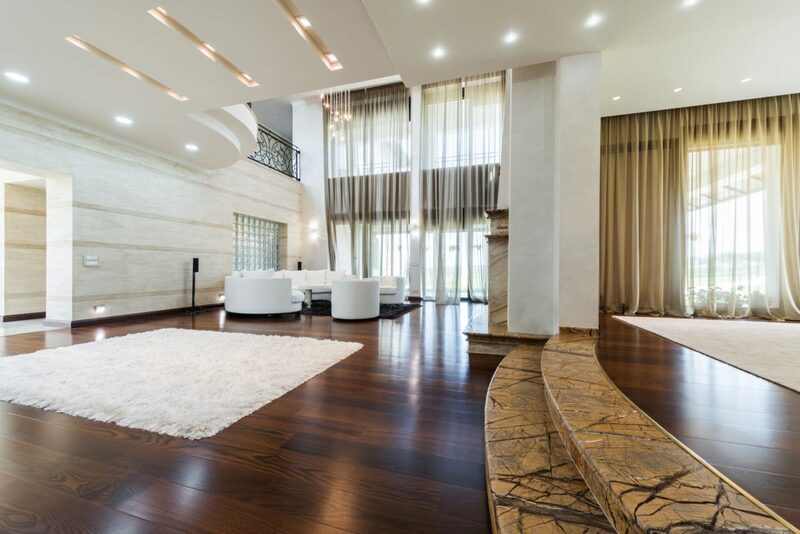 The price of a hardwood floor refinishing in Kansas City is determined by the materials, the equipment used, and the number of hours of labor that it takes to perform the job. In general, for a basic refinishing job, it will take a contractor about 4-5 hours per 100 square feet of space. It would also take someone doing it themselves, in most cases, 4-5 times longer to do the same amount of installation or sanding and finishing. Professional companies like Armstrong-Citywide, can re-sand, stain and finish most jobs complete in 3 days. Our products are commercial grade flooring stains and finishes that have a proven track record of decades. You should also know that our products are not available in any retail store, and cannot be purchased unless you are a professional wood floor mechanic. Generally, smaller rooms are going to be more expensive to refinish per square foot. This is because the equipment used to sand down a hardwood floor is usually quite large, and it is not easy to get it into or maneuver it through tight areas. Some small bathrooms, powder rooms, and laundry rooms may be too small to refinish at all without the help of a specialist with the necessary equipment. On the other hand, you can often get a discount on a project to refinish a larger space. Discounts may also be possible for doing multiple rooms at a time. Larger projects represent more money for less effort to contractors, and so they are usually willing to offer discounts to secure these jobs. Sometimes you will be able to find companies offering hardwood refinishing services in Kansas City at extremely low prices. Unfortunately, you usually get exactly what you pay for, and bargain basement offers may lead to shoddy work or jobs that take longer than they should. Repairs to these mistakes can end up costing more than the original project. The room you refinish will need to be cleared of any furniture or furnishings before starting the project. This is generally not included in the estimate of a project, and if the contractors have to take care of this themselves, they may charge a premium for the service. Another thing to consider is that if space is at a premium, you may end up having to move all of your furniture to one side of the room or house before starting the project. Then you will have to wait for the sanding, staining, and finishing tasks to all are complete and dry. At that point, you will have to move all of the furniture over to the finished side and start over again. This can not only prolong the project but can also inflate the cost. Refinishing a hardwood floor in Kansas City can be a messy process, and most of the time the contractor will not even offer the option of paying them for cleanup afterward. Because of this, you may need to factor in the cost of a cleaning service when determining the total expense. If a floor is damaged beyond a certain point, refinishing it won’t be effective. In this case, the floor will need to be repaired before it can be refinished so that the final look ends up being consistent across the entire room. Of course, this will drive the cost up as well. Often there will be a hardwood floor lurking just beneath the surface of other materials such as carpet, cork, or vinyl tile. When these floor coverings start to wear with age, you will have the choice of replacing them or ripping them up, and refinish the hardwood below. If this is the case, make sure that you get an estimate for the removal of old flooring in addition to any other expenses. When installing a wood floor in Kansas City there is also much to know then just having the smooth side up. The condition of the environment plays a huge role in the success of wood flooring. You must know the difference between the moisture content of the wood flooring and the sub-floor and install only if the proper differences in moisture content meet the wood floor material guidelines or failure is likely. Nailing patterns, expansion gaps and how far to keep end joints apart are also just some of the information needed to have a successful installation. While watching a video on how to do these things can be nice but, not always is the information correct and professionals can make it look easy. When using Armstrong-Citywide to install, sand, stain and finish or re-finish your existing wood floors you get insured professional people to do the work, commercial grade products, state of the art equipment, and a guarantee from a company that has been doing only wooden floors since “1962”. Remember, it’s more than just the cost of renting equipment and stains. Contact us today for an estimate!